Polk Audio VS 265-LS may be part of their Vanishing series, but one listen and you’ll know this in-wall speaker is no “wall flower.” The 265-LS offers stellar sound in an inconspicuous design that hides in your wall. Whether you’re using this speaker as the basis for a stealth home theater, or a pair for stereo listening, its performance rivals that of Polk’s flagship LSi M series traditional loudspeakers. 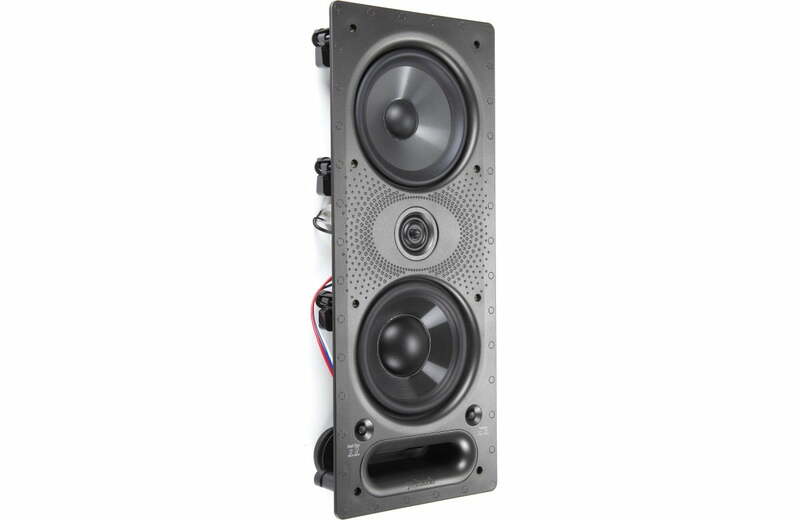 In fact, you can put together a system mixing this in-wall speaker with free-standing LSi M floor-standing or bookshelf models — whatever suits your room and your decorating sense best. The Polk Audio VS 265-LS begins with dual 6-1/2″ Dynamic Balance drivers, which deliver clear, accurate mids and dynamic lows. Polk’s PowerPort bass venting system reinforces the bottom end for clean, punchy bass. The 265-LS uses Polk’s own advanced version of the classic “ring radiator” tweeter for smooth, detailed highs. A wall distance toggle switch lets you compensate for boominess due to installation near a side wall. You also get a tweeter attenuation switch to help you get balanced sound in rooms with lots of reflective surfaces. Finish off by painting the magnetic Sheer-Grille™ to match your wall color, and the 265-LS is ready for showtime. 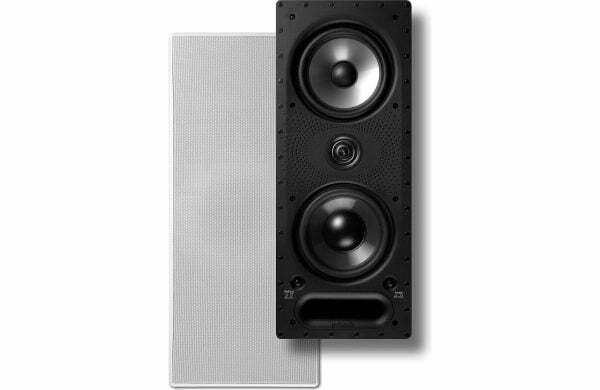 Vanishing Series In-Wall Speakers: The Polk Audio VS 265-LS Vanishing Series in-wall loudspeakers feature a precision-engineered, minimally flanged design and Polk’s exclusive Sheer-Grille, which protrudes only 7mm from its surroundings. Installing virtually flush in your wall, the Polk Audio Vanishing Series in-wall loudspeakers offer a one-cut, drop-in installation and rotating cam stabilizing system. The Vanishing LS series in-wall speakers are timbre-matched to Polk Audio’s flagship LSi and LSiM series loudspeakers for seamless blending from speaker to speaker when you’re building a speaker system. Dual 6-1/2″ Drivers: This Polk Audio VS 265-LS Vanishing Series 265-LS in-wall 3-way loudspeaker employs a 6-1/2″ Dynamic Balance aerated polypropylene cone midrange driver, and 6-1/2″ Dynamic Balance aerated polypropylene woofer, both with rubber surrounds, for a smooth, consistent frequency response. The aerated polypropylene cones are 20% lighter than conventional polypropylene, and 35% lighter than aluminum, to give you clear midrange, punchy bass, and high efficiency. Polk Audio’s patented Dynamic Balance technology eliminates unwanted resonances. 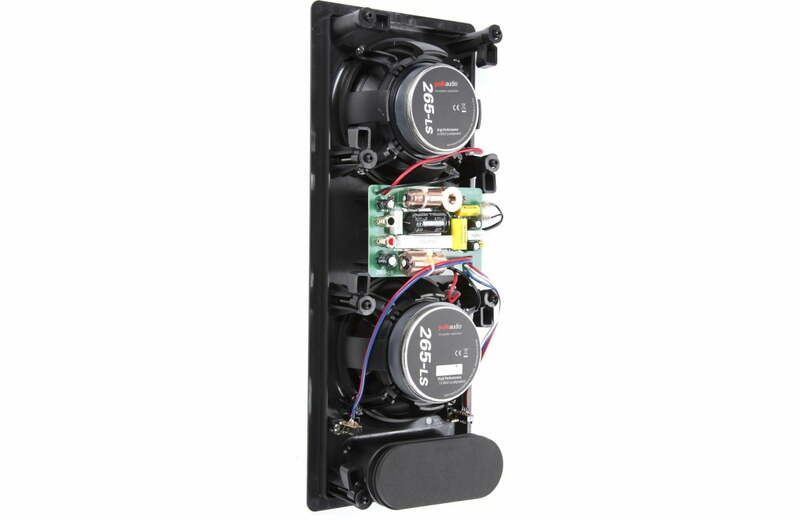 Ring Radiator Tweeter: The 265-LS employs a 1″ Dynamic Balance ring radiator tweeter for detailed highs and superb imaging. This high-performance tweeter features a 15° swivel housing, for more direct high frequency control, excellent off-axis imaging and more placement flexibility. Reflective Room Compensation Control: The Reflective Room Compensation Switch, conveniently located on the front panel, allows you to digitally compensate for harsh reflective surfaces, such as smooth walls, glass windows, and hardwood floors. The filter doesn’t merely reduce high frequencies, it simply cuts the level only in the 4-5kHz range where room acoustics most often interfere with performance. The switch is labeled “Tweeter” with two positions: out (normal) and in (filter). Wall Distance Toggle Switch: If you mount your in-wall loudspeakers closer than 2 feet from a side wall, the proximity of the surface can elevate the midbass response between 50 and 200Hz, causing a boomy sound. To compensate, the 265-LS is equipped with the Vanishing Wall Distance Toggle switch, located on the front panel. The filter adjusts the crossover to flatten the response, and tune out the boominess, without sacrificing the deep bass response of the speaker. The switch is labeled “Wall Dist.” with two positions: in (<2′ ) and out (>2′). PowerPort: The Polk Audio VS 265-LS features Polk’s PowerPort bass venting, a patented port design that enhances the speaker’s bass response while eliminating noise caused by the moving air turbulence. The provided foam rubber port plug should be used if you are installing the 265-LS in an area larger than a standard open stud bay. Sheer-Grille: The 265-LS features Polk Audio’s exclusive wafer-thin Sheer-Grille, a magnetically-secured metal grille that protrudes only 7mm from its surroundings. The Sheer-Grille can be painted to match your décor, making it virtually indistinguishable from its surroundings. The Sheer-Grille has nearly transparent, ultra-small perforations, and is acoustically inert, for dynamic, unimpeded sound and more uniform coverage, even in larger rooms. The grille’s dimensions are 8-7/8″ x 20-7/8″. Note: The speaker isn’t recommended for installation in high-moisture locations. Existing Construction: In existing walls, use the included cardboard template for one-cut, drop-in simplicity. Achieve secure, vibration-free efficiency with a simple turn of Polk’s Rotating Cam system (8 rotating cams).